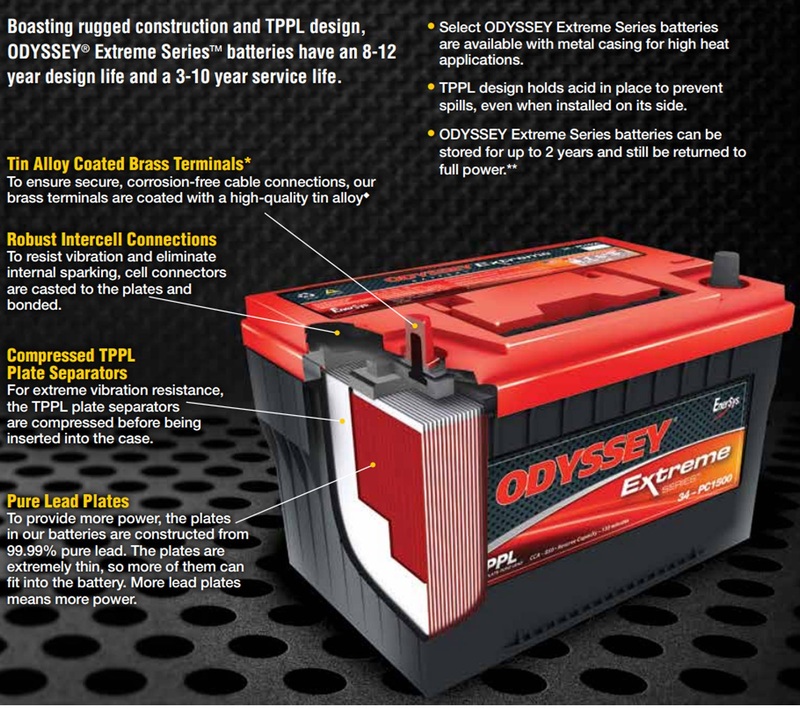 The all new Odyssey Extreme batteries gives out twice the overall power as conventional batteries! Some batteries offer enormous cranking power while others, deep cycle reserve power. The Odyssey Extreme Series do both. This is possible due to the flat plate design used in every Extreme battery. Compared to conventional models, Odyssey Extremes are made with 99.99% pure lead and not alloy. Pure lead plates are significantly thinner than lead alloy allowing more plates to fit within every Extreme battery offering the Extreme juice you need. More plates equals more plate surface area equals more overall power, twice as much as traditional options! Compared to spiral-wound designs, Odyssey Extreme Series has 15% more plate surface area that makes use of every inch of space within the battery. The Odyssey Extreme Series is an incredible combination of power and endurance that makes them ideal for just about anything and anywhere. Heavy Duty/Commercial: Tractor trailers, Earth-moving construction equipment, Farm, and Lawn equipment. Need more Odyssey PC545? We offer great discounts on quantity orders and FREE SHIPPING offers are available.